For easy, economical installation and an exceptionally smooth joint, choose Alligator® Belt Lacing Fastener System. Steel or stainless lacing is available in continuous lengths to fit any belt width. The hammer-applied splice requires no special installation tools and is ideal for low-volume users with belts up to 1/2" (13mm) thick. 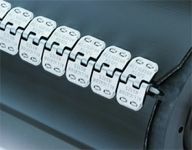 Alligator Belt Lacing can operate over pulleys as small as 1" (25mm) in diameter, or on belts with mechanical fastener ratings to 200 PIW (35 kN/m). One-piece design provides uniform tension across the full belt width. Also helps ensure that no loose pieces work themselves out of the belt and into conveyed product. For belts operating over smaller pulleys – such as in construction equipment and road machinery – Flexco® Bolt Hinged fasteners are strong, dependable and easy-to-install. Hinged construction makes Bolt Hinged fasteners ideal for applications requiring frequent belt-length alterations, the joint can be separated simply by removing the hinge pin. A variety of hinge pins are available to match your application. Ideal for rubber plied and PVC solid woven belting, and for worn belts unfit for vulcanized splices, the Flexco® SR™ Rivet Hinged System delivers the performance, long life, and easy installation that maximize belt availability. Specially designed for the abusive round hay baling application, Alligator Rivet Fasteners are an affordable way to simplify belt maintenance and increase uptime. With pre-inserted staples and a one-piece strip design, Alligator Ready Set makes splicing quick and easy. High resistance fasteners using self tapping screws.